Hopefully most male readers of the fishing report realize that Mother’s Day is quickly approaching this coming Sunday. We all know that our mothers put up with a lot of our shenanigans when we were young aspiring fishermen. They most likely ranged from digging up her flower bed for worms to be used on the opening day of trout season or perhaps dried out worms in the laundry and let us not forget the countless number of times muddy sneakers and jeans were deposited in the laundry. Being late for dinner when we needed “just one more cast” to entice some mysterious hidden lunker of a fish that had eluded us all day was a well used excuse. My personal favorite was foiling my mom’s wrist watch solution to my tardiness for dinner by claiming the watch must be running slow and turning the minute hand back by 20-minutes. Our moms just rolled their eyes and now into adulthood our wives take over as we continue to think up every excuse in the book for “one more cast”. Happy Mother’s Day to all the moms out there you have certainly earned it by putting up with a fisherman. Fishermen that have been pitching shad darts into the Susquehanna River recently are beginning to see their catches switch from only Hickory Shad to White Perch, Striped Bass in the 20″ size range and some American Shad. Fishermen are reporting that the fish tend to congregate in some of the deeper pools along the river all the way up to the dam pool and chartreuse shad darts have been out fishing all other colors. The white perch concentrations are reported to be great and fishermen are catching a lot of nice sized ones. Shad biologist Chuck Stence who has been collecting Hickory Shad brood stock in the lower Susquehanna recently believes that low flow conditions from the dam may have retarded the Hickory Shad runs in Deer Creek at present but increased flows from the dam should spur on at least another good run of Hickory Shad. Striped Bass fishing in the upper bay below the Brewerton Channel line has been good for fishermen who are trolling, jigging or chumming. The channel just north of the Bay Bridge, the Dumping Ground and around the bridge itself have all been good areas to troll tandem rigged parachutes and bucktails and the word is that white has been the hot color recently. Chumming and chunking has also been productive at Podickory and Love Points and jigging near channel edges and piers at the Bay Bridge have also been good. Shore bound fishermen have been catching Striped Bass at sandy Point State Park and the Matapeake Fishing Pier. Kimmie Adams helped her father trailer their boat from Hagerstown to launch at Sandy Point State Park and was rewarded with this beautiful Striped Bass while trolling an umbrella rig. Surface water temperatures in the middle bay area are finally hitting the 60-degree mark and fishermen are beginning to see large Striped Bass in other areas besides the shipping channel this week. The steep edges of the shipping channel are still the most productive areas for trolling and none seems hotter than the western edge from Thomas Point south to Cove Point with Chesapeake Beach being ground zero. Bloody Point Light, Buoy 83 and channel edges down to Hooper’s Island Light as well as Buoys 70 and 72 have also very good places to troll. Tangier Sound and the lower Potomac River also continue to be very good places to find large Striped Bass. Menhaden is what is on the menu for these post-spawn Striped Bass and if you find the bait you will find the Striped Bass. For this reason and also warming water temperatures fishermen are reporting finding large Striped Bass in places like Eastern Bay and the mouth of the Choptank and Potomac Rivers and catching them by jigging large soft plastic jigs or traditional trolling methods along steep channel edges. As the calendar moves into the month of May and water temperatures climb in the bay reports are coming in from the lower bay of croakers and speckled trout beginning to show up. Usually the Tangier/ Pocomoke Sound complex are where these reports first begin to drift in as well as the lower Potomac River. Anticipation is high for these species as well as hope that the 14″ to 16″ Red Drum that covered us up last year will return as Red Drum over the 18″ minimum. White Perch are beginning to show up in some of the more traditional fishing locations in the lower sections of the bay’s tidal rivers this week. Fishermen are finding them deep with small jigs such as shad darts and bottom rigs baited with bloodworms. Freshwater fishermen at Deep Creek Lake are beginning to see more and more floating docks being deployed and these structures are a magnet for pre-spawn largemouth bass as are emerging grass beds. Spinnerbaits, soft plastics and suspended jerkbaits are all good baits to flip near these areas. Smallmouth Bass fishing is definitely on the upswing and fishermen are finding them on rocky points and outside of the floating docks; tubes, jigs and small crankbaits are all good option when spring fishing for Smallmouth Bass. Large Northern Pike are still holding at the mouths of coves and transition areas near shallow areas and can offer some exciting action on large spinnerbaits and plugs. Smallmouth Bass fishing in the upper Potomac continues to be good this week; most of the fish are in the 12″ to 14″ size range with enough larger fish to keep things interesting. Recommended baits include suspended jerkbaits, tubes and spinnerbaits. Walleyes are reported to be holding near the down river and up river edges of deep pools. Trout fishermen continue to enjoy good trout fishing opportunities this week in trout management waters. Fisheries crews have generously stocked many areas and the cool weather and good water flows have the trout in a feeding mood. 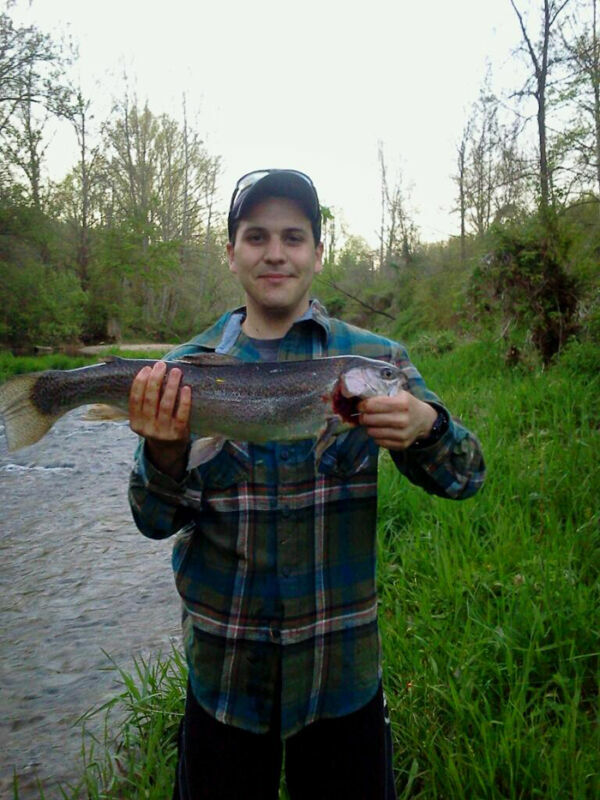 Carson Mayer was fishing in Big Elk Creek in Cecil County when he caught this nice rainbow trout which he entered into the Maryland Fishing Challenge. If Carson’s luck continues he may win a boat, motor and trailer combo donated by Bass Pro shop at the awards ceremony on September 7th at Sandy Point State Park. Largemouth Bass fishermen are finding their fish in a variety of phases this week. In the colder western region Largemouth Bass are still in a pre-spawn mode of behavior but in most other regions of the state they are either actively spawning or are finished. All types of shallow cover are good places to target with suspended jerkbaits, spinnerbaits and soft plastics for some fun catch and release fishing in non-tidal waters. The prospects for good fishing this week in the Ocean City area look good after some rather pesky northeast winds last week. Surf water temperatures are holding around 50-degrees and fishermen are anticipating the northward migration of post-spawn striped bass from the Chesapeake Bay. So far only a few have been caught and hordes of spiny dogfish and skates are more than happy to chew up baits. Fishermen using smaller presentations have been catching a few Kingfish and small Bluefish and a surprising number of blowfish. Inside of the inlet fishermen are catching tautog from the jetties, the Route 50 Bridge and nearby bulkheads and fishing piers. A few Striped Bass over 28″ are being caught at the inlet at night on swim baits and live eels. In the Back Bay areas fishermen are catching flounder in the traditional channel areas with the best bite occurring on a falling tide. Jim Findley and Chris Derr pose with a three man limit of flounder they and the photographer caught in Sinepuxent Bay. Nasty winds have kept the Ocean City fleet from heading out to the wreck sites to fish for tautog recently but conditions have changed for the better this week. Large tautog will be waiting for fishermen on the wreck sites.